Now that family time is winding down, I thought I’d get back on the horse, writing-wise, and share a few moments from the last two weeks in the Philippines. I’m also going to call the 60-Day Blogging Challenge a loss. I didn’t write every day for 60 days, and even though those days were at the end, when things got super busy, it’s a bit late to ret-con the whole thing as a hiatus. I got close, though, so that’s something. Anyway, enough wallowing. As some people may know, The Philippines got hit with a mid-size typhoon, which, according to most accounts could have been a lot worse. Here’s a video I took of the winds outside. 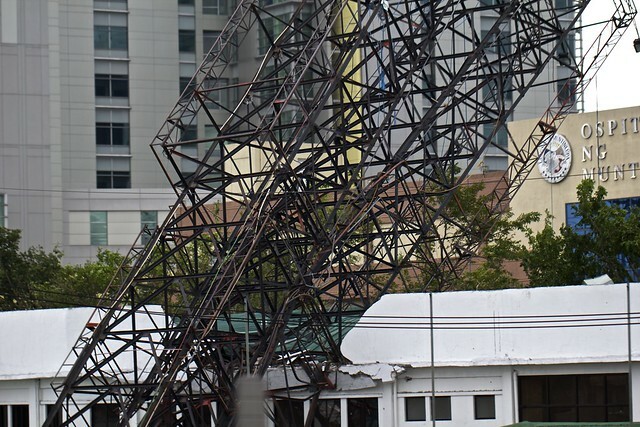 The power had gone out, and I was trying to work, using a mobile WiFi device, but service was spotty, especially as cell towers went down, or when flying debris battered them into a wiry pulp. 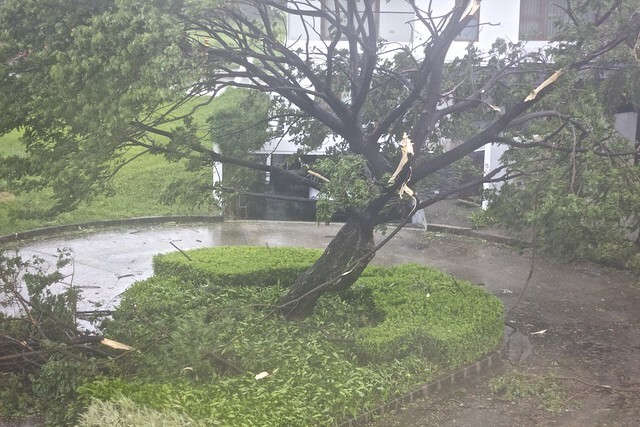 During one service outage, I took the above video, and then, when I’d moved upstairs, I snapped the following picture as one tree began to disintegrate. The damage in this particular neighborhood was light: missing roof tiles and shingles, several downed trees, and a couple crushed fences. 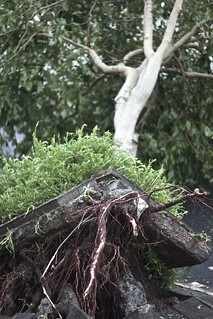 But a quick excursion into the city proved that the storm had been somewhat stronger than first thought. 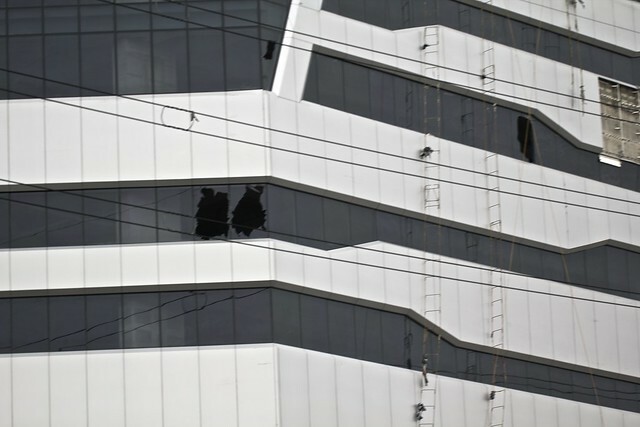 Windows in a nearby high-rise were blown out, and the roof of a hotel (not pictured) was partially destroyed. At one point during the early hours of the storm, something oblong and orange flew by, caromed off the upper wall of the house, and disappeared down the road. I’m almost certain we were hit by a mango, though there remain skeptics. It is possible, nay likely, that those windows fell victim to other such projectiles. Due to the high volume of such storms, the city has taken to having billboards that can roll up and be stored on site. If the advertisement isn’t stowed in time, it can act like a sail and pull the whole structure down with it. Of course, some of these frames are old, have been through several storms already, and are ripe for the picking. 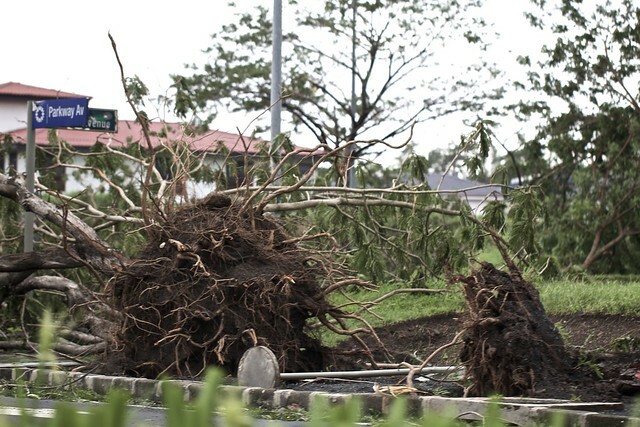 Trees like the above and below littered the streets, both in Manila proper and especially in the suburbs, where larger trees caught the wind and toppled over, often taking street signs and chunks of the sidewalk or road with them. 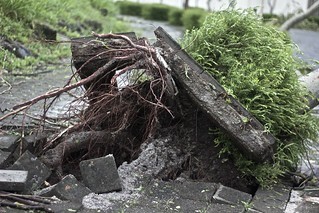 As soon as the winds had died down, reconstruction and debris clearing began, but it turns out, some of the funds going toward disaster recovery are held up due to investigations into corruption and pork-barrel politics. Oops. Stay tuned for Part II, the lighter, fluffier side of this trip. I just thank the fates that Malaysia Ground was safer than Malaysia Air. Let the mangoes do the flying.